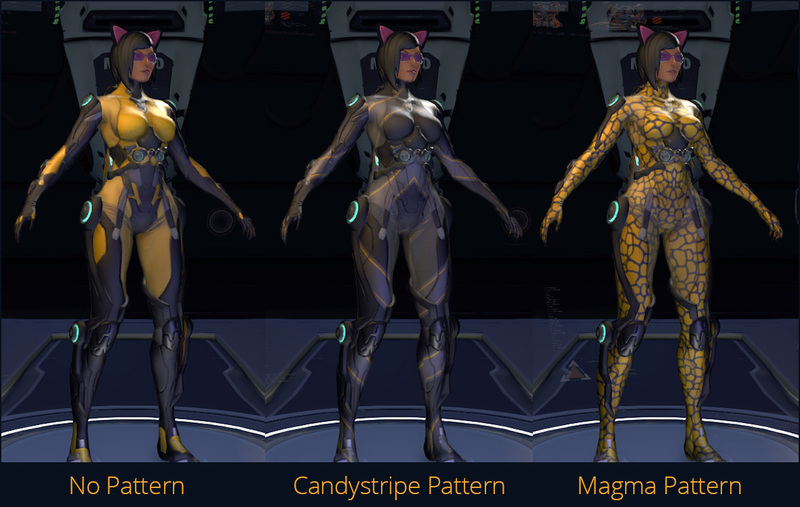 In Firefall warpaints are the main means of customising the appearance of your battleframes, and you can get them in a number of ways. In our Complete Firefall Warpaints Guide we’ll take a look at all the warpaints and where they come from. Updated: 1 March for Patch 0.8.1744 with all current warpaints and frames! To apply a warpaint to your battleframe, open up the Garage and select the frame you want. Use the button on the right hand side to enter the Paint Shop, and you’ll see an option to change Frame Warpaint. Seelct this, and you’ll be presented with a list of warpaints to choose from. Some might have a Red Bean cost associated with them. The warpaint you select will be previewed on your frame in the garage, but it won’t be applied until you hit the Confirm button in the top left. If the warpaint costs Red Beans, the Confirm button will also deduct the cost from your Red Bean total. Red Bean warpaints are now permanent purchases — once you buy it once, you’ll be able to reapply it for free to any frame you own. (This is a new feature; Red Bean warpaints used to be one-off purchases.) As well as unlocking them through the Garage’s Paint Shop, you can also buy Red Bean warpaints from the new Red Bean store — hit Escape and select the “Store” button at the top of the screen. Here’s a look at all the warpaints currently usable in game. Click on a warpaint image to see a larger version of the warpaint, or check out the Warpaint Browser below to see all the paints! These warpaints are always available, and you don’t have to do anything special to unlock them. These warpaints cost Red Beans, and several of them can also be unlocked as part of a Visual Kit — see the Visual Kits section for details. This warpaint can be unlocked using a Visual Kit. This warpaint can be unlocked in the Garage, but does not appear in the Red Bean Store. These warpaints are available as part of Visual Kits, which are prizes from the Red Bean lottery terminals. Each Visual Kit includes a warpaint, decal and title, and is themed around a Holmgang team. These Visual Kits can also be sold on and purchased from the marketplace, provided they’re unused. To use one of these warpaints after you’ve acquired the Visual Kit, you’ll need to select the Kit from your calldowns menu and use it from your #5 ability slot. This will add the warpaint, decal and title as options for your character, although you may need to relog to see them in your garage’s Paint Shop. Also available from the Red Bean store. These warpaints are unlocked by maxing out different battleframes. Unlocking a frame’s constraints to 10 Mass, 10 Power and 10 CPU will unlock that frame’s default warpaint and allow it to be used on any other frame. This can create some very impressive looks, as many of the default warpaints look very different on other frames. Source: Maxing out any Accord frame. Source: Maxing out the Arsenal battleframe. Source: Maxing out the Bastion battleframe. Source: Maxing out the Dragonfly battleframe. Source: Maxing out the Electron battleframe. Source: Maxing out the Firecat battleframe. Source: Maxing out the Mammoth battleframe. Source: Maxing out the Nighthawk battleframe. Source: Maxing out the Raptor battleframe. Source: Maxing out the Recluse battleframe. Source: Maxing out the Rhino battleframe. Source: Maxing out the Tigerclaw battleframe. These warpaints are unlocked by in-game activities. At present there’s only one entry in this category, but you can expect it to grow! This warpaint is unlocked by completing the My Name is Hendrix Lake achievement in the Blackwater Anomaly instance — you’ll need to collect all five SIN imprints from around the instance on twenty separate runs. For more information on this achievement, check out our Blackwater Anomaly Gameplay Guide. These warpaints are or were available only during specific in-game events. This warpaint was available in February/March 2014 for Carnaval. This warpaint was available in February 2014 for Valentine’s Day. These warpaints are (or, in many cases, were) available as part of a promotional event or special package. This warpaint was available in 2012 as part of a promotion with AMD; it was unlocked using a code that came with certain AMD products. Note that this warpaint features an unusual gradient which can’t be captured properly out of game, which is why this shows an ingame screenshot. This warpaint is currently available as part of a promotion with Razer; it can be unlocked with the purchase of a Razer Deathadder 2013 mouse. This warpaint was available during Closed Beta, as one of the rewards for purchasing a Founder’s Pack. It is no longer available. This warpaint was one of the rewards for purchasing an ARES Starter Pack. In addition, purchasers of the smaller Operator Starter Pack had a 20% chance to unlock this warpaint as their included cosmetic item. It is no longer available. This warpaint was one of the promotional incentives for buying Red Beans in October and November 2013. It came free with all Red Bean purchases of $20 or more. This warpaint was available to founders during Firefall Fest 2012. It’s no longer available. This warpaint was a reward for logging in during Firefall Fest 2013, to celebrate the launch of Open Beta. It’s no longer available. Codes for this warpaint were given away at Gamescom 2013 and the accompanying TwitchTV livestream. The warpaint was also available in-game during the last week of August 2013 – it was purchased for 5 Omnidyne-M tokens, which could be earnt by daily missions during the event. These warpaints are special cases! Armor patterns are another cosmetic customisation option; you can apply them in the Garage. Some are unlocked using Red Beans; others can be acquired as lottery terminal rewards. Armor patterns can have a significant impact on the way a warpaint looks on your battleframe, so if you see someone wearing a look you can’t identify, they might be achieving their unique appearance with an armor pattern. There are also bodysuit patterns, which affect the non-armored areas of your character’s appearance. There are fewer of these than of the armor patterns. 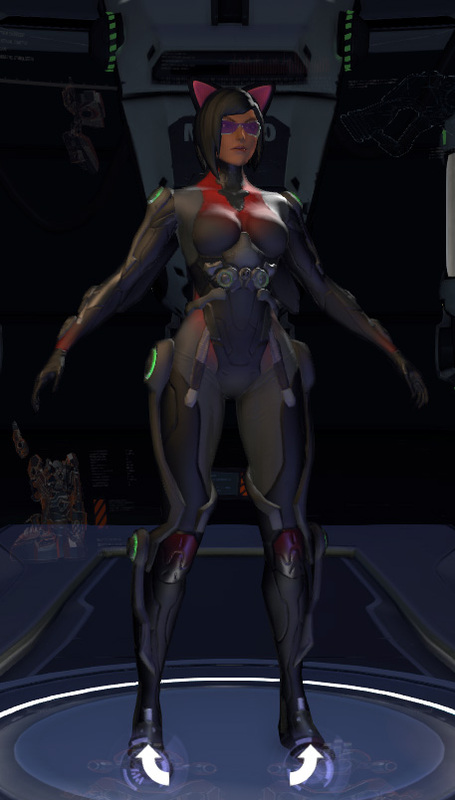 Red Bean armor patterns have a matching bodysuit pattern, but the armor patterns from the lottery terminal don’t seem to have bodysuit counterparts. Here’s an example of how an armor pattern can really change a frame’s look. For more on armor patterns, keep an eye out for our upcoming guide! Use the browser to check out all the warpaints – see how each warpaint looks on your favourite frame, or compare how different frames look in the same paint! Siha is a longtime gamer and game blogger. She writes her own gaming blog at Siha Games! and has been enjoying Firefall ever since she scored a beta key. Amazing write up and over all guide. Any chance this will ever be updated again? Thank you for the amazing work. In the Progression Warframe List, you posted a screenie of the Accord base frames when maxed. To me it looks like the no frame option that you start on default with. Is this white frame, when a base accord frame is maxed, any different from the default / no warpaint one? 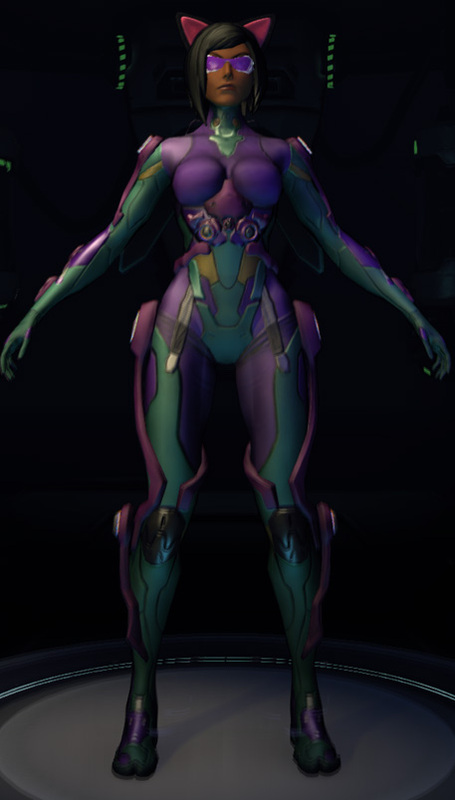 In all cases, the “default” warpaint for a battleframe (ie the one that shows if you have no paint selected) is the one that you unlock when you max out that frame. It’s the same for the Accord frames. This reply left me a little confused :/ can you please elaborate? Well, every frame has a “default” warpaint — that’s the colouring that shows if you have “none” selected in the warpaints menu. When you max out a frame to 10/10/10, that default colouring is unlocked as a warpaint for you, and it will then appear in the list of warpaints you can use for other frames. So if you max out an Accord frame, you’ll get a warpaint called “Accord” with the white and black colouring. It’ll look just the same as the Accord frames when they don’t have a warpaint applied, but you’ll be able to use it on any other frame you like – so you could put it on a Bastion or a Mammoth, for example. Basically, maxing out a battleframe lets you use that frame’s default warpaint on other battleframes. So if you had a maxed Dragonfly, for example, you would unlock the ability to use the Dragonfly’s green-and-gold-with-blue-lights color scheme as a warpaint on any of your other frames. Since all the Accord frames have the same basic white warpaint, maxing any one of them will unlock the Accord warpaint to use on whatever other frames you have. As a side note I have obtained the special Red 5 warpaint by participating in the last closed beta weekend before open beta. Sorry i have read on and discovered what i actually had, sorry for my silly mistake. Yes now it makes sense, actually it was explained nicely in the guide in the appropriate section but somehow I thought maxing a frame would give a “new” warpaint previously unavailable even to that frame. Its all clear now thanks! Sweet Guide Astrek Association! I love the browser! Hey, I see an “Ares” warpaint listed in the warpaint browser, but no mention of how to get it in the article. Any details on that? It’s in the Promotional Warpaints section of the guide – it was the warpaint from the recent Starter Pack (which is available until September 6th now, apparently). Huh. I must have misclicked. When I viewed it in the browser it appeared to be an interesting dark color like the Locust paint. Don’t know how I managed that. Thanks for the work. Good stuff here. Actually, swapping to Raptor it is much darker than with the other frames. It’s why I skipped over it looking for it listed in the article, it didn’t look the same at all. Is it really that dark with Raptor? Looks pretty sweet. omg, a lot of work there. I love astrekassociation !!!! This is so AWESOME!!! Thank you Astrek Association! My only wish now is that I could purchase permanent versions of the Team Unicorn and Team Midair war paints. Anyone else think the Vapor warpaint is a match for Gordon Freemans suit? Isn’t that a picture of three bodysuit patterns? 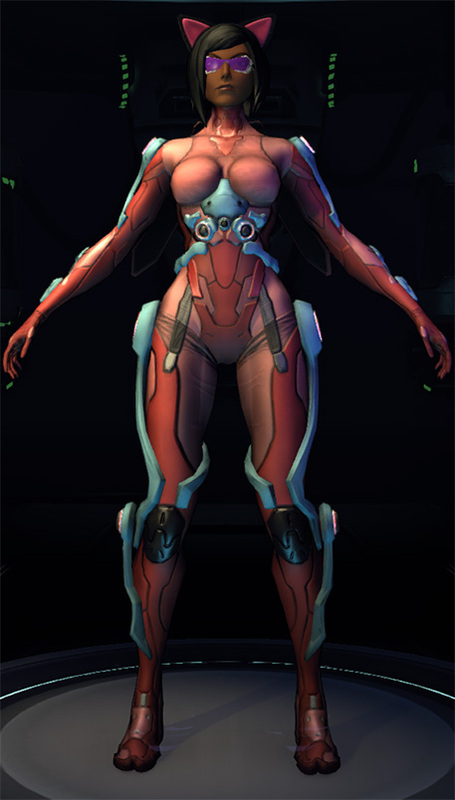 No, they’re all armor patterns – the bodysuit pattern affects a different part of the overall frame model. 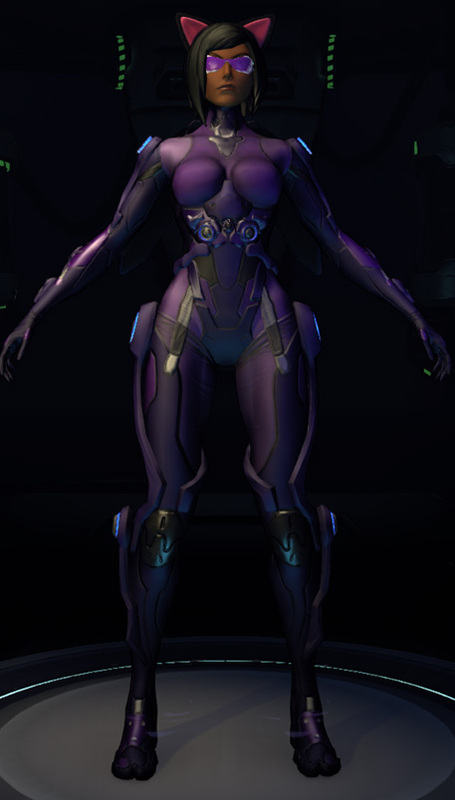 One thing that confuses me: I have tried the different bodysuit patterns on all six Accord frames, and seen absolutely no difference for any of them. 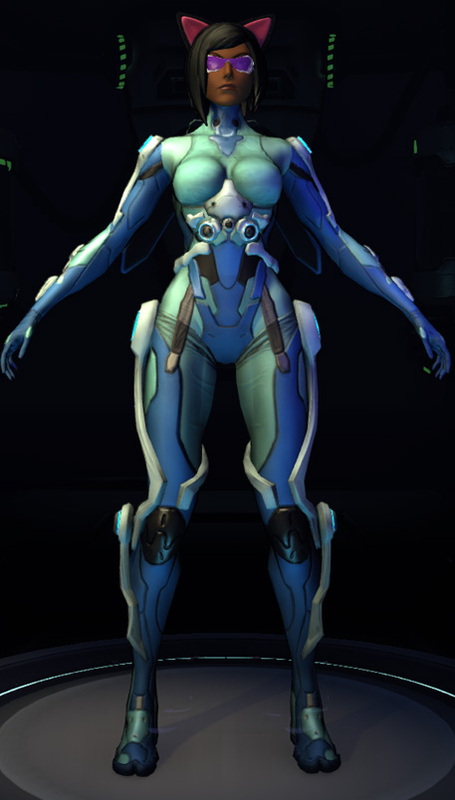 Do only the advanced frames have parts that are declared as bodysuit or am I missing something? You never fail to amaze everyone Siha! Kudos and keep up the awesomeness! We’ve been planning on doing that, but it’s a big roundup, so it’s still in the works! Great job! But i see news warpaints that dont see here: Jungle camo, Splatter, Diagonal for example. Thanx!